Balzer + Bray, 9780062365910, 40pp. 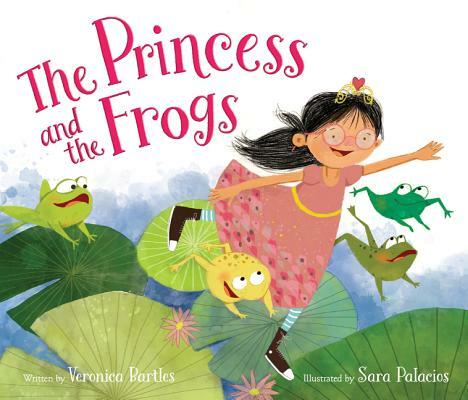 A delightfully funny reinvention of the classic fairy tale "The Frog Prince," from author Veronica Bartles and illustrator Sara Palacios. Once upon a time there was a princess named Cassandra who had everything she could ever wish for…except a pet frog to be her best friend. So when the Royal Pet Handler finds her the perfect little green frog with bumpy brown spots, Cassandra couldn’t be happier. Until she gives her friend a good-night kiss and—WHOOSH!—he turns into a prince! But princes aren’t pets. Cassandra wants a frog! Soon her castle is overflowing with princes, and if Cassandra doesn’t find a way to fix the situation, her overcrowded castle might burst at the seams—and she may never have a frog of her own. Veronica Bartles grew up in Wyoming and currently lives in Maryland with her family. As the second of eight children and the mother of four, Veronica is no stranger to the ups and downs of sibling relationships. She uses this insight to write stories about siblings who mostly love each other, even while they're driving one another crazy. When Veronica's not writing or lost in the pages of her newest favorite book, she enjoys creating delicious desserts, exploring new places, and knitting with recycled materials. Sara Palacios is the recipient of the 2012 Pura Belpré Illustrator Honor for her work on Marisol McDonald Doesn't Match/Marisol McDonald no combina. A native of Mexico, Sara graduated from the National Institute of Fine Arts in Mexico City with a degree in digital graphic techniques and went on to earn BFA and MFA degrees in illustration from the Academy of Art University in San Francisco. She works with a variety of media such as collage, ink, and digital artwork.